Yum. I just wanted to post a picture of my dinner last night. Fairly giant pizza, and I accidentally at most of it. I’ve been craving pretzels since I was at the McCarran National Airport in Vegas waiting for my flight home from Utah. There was an Auntie Anne’s pretzel booth. I always thought that pretzels were one of those “naturally vegan” foods, but I still asked if they had an ingredient list. They didn’t, but they said that all of their pretzels contain dairy ingredients. I sat down at a nearby table and pulled up their website, but couldn’t find any ingredient information online – only nutritional facts, which aren’t worth a can of beans. Combine water, sugar, and yeast. Let rest ten minutes. Add oil, flour, salt, and knead for 10 minutes (or put in a bread machine). Divide and roll into long ropes; shape into a pretzels. Place on a baking sheet (preferably covered in parchment paper) until doubled in size. The recipe says 45 minutes, but it only took about 20 today in 80ºF weather. Preheat oven to 450ºF. Bring water and baking soda to a boil. Liberally brush hot water/soda onto each pretzel and sprinkle with kosher salt (or poppy seeds, sesame seeds, etc). Bake at 450ºF for 12-15 minutes, flipping baking racks half way through if you have two sheets. Yield: 6-8 giant pretzels. Or 12 smaller pretzels for pot lucks and house guests. Nothing beats fresh, hot pretzels. Serve with vegan cheese sauce… I’ll post a recipe for this some day. Oh yeah, Niko enjoyed the pretzels too. The first thing to understand about pita is why a flat pice of bread gets a pocket in the middle of it when you bake it. The answer: when you place moist dough in a very hot oven, the moisture in the dough turns to gas, pushes the dough out, and forms a pocket. I should admit: I cheated and used a bread machine for the first part of the kneading process. But, since I got a bread machine, I’ve been cheating away the first 10 minutes of bread-making anyway.. 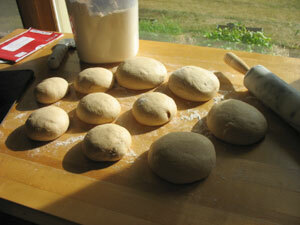 So, the first step in making pita bread is having a dough that is not too dry. In past biscuit-making adventures, I’ve encountered a lot of dough that seemed very sticky. 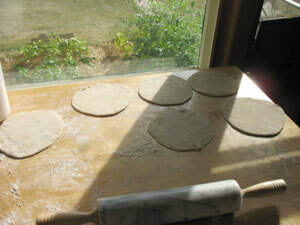 My initial response to sticky dough was to simply add more flour – not so! If you can’t work with the wet dough, then just get your hands wet as well. The dough won’t stick to your hands, and as long as you put enough flour on the surface you plan to set the dough on, you’ll be just fine. (By the way, this “moist dough” theory seems to apply to a lot of artisan breads as well). This recipe makes 8-12 pockets, depending on how big you want them to be. As soon as you mix the dough together, cut it into 8-12 pieces (a pizza cutter works well), and then roll each pice into a round ball. Put all the balls together (not touching) on a well-floured surface, and cover with a damp dish towel. Let them sit for 30 minutes. Roll out the balls into discs – they should be about the width of a yard stick. Place the discs onto baking sheets. 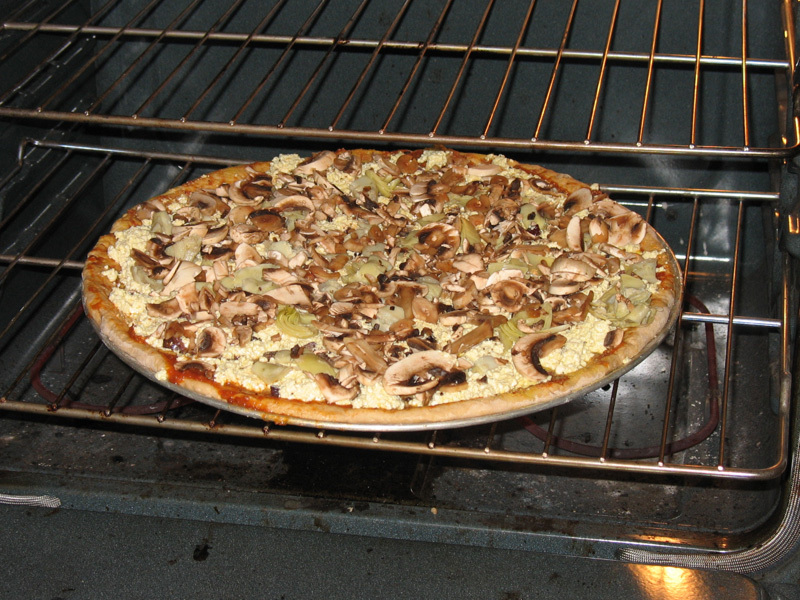 The next step: make sure that you have a HOT OVEN. The oven needs to be pre-heated to 500ÂºF, and every time you take cooked pita out of the oven, let the oven heat up for another minute or two before putting another sheet in. Also, I have found that it’s best to cook pita on the bottom-most rack and only cook ONE SHEET of pita breads at a time. If the oven is hot enough and your dough is moist enough, your pitas should puff up in the oven. Don’t let them cook too long – 5-7 minutes is long enough. If they start to turn brown on the top, take them out! Over-cooked pitas will crack and fall apart. Let the pitas cool until you can touch them, and then put them into a paper bag, sealed tightly, adding each batch of pitas as you cook them. 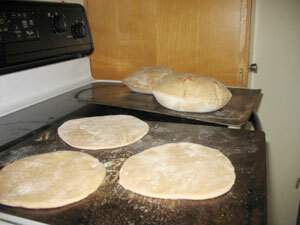 Let the pitas cool off in the bag – they will deflate, forming a flat bread with a pocket inside. Stuff, eat, yum.